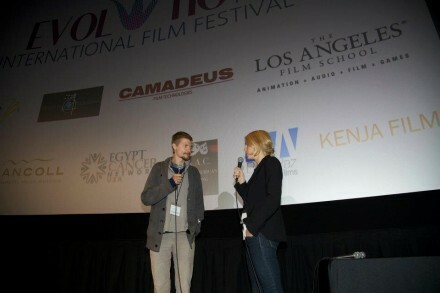 The Evolution International Film Festival successfully kicked off its first event on March 17, 2012 in Hollywood, CA. The screening program included 21 films with categories ranging from; Feature film, Short film, Documentary Feature and Short, Animation short, Music Video and Student short film. The program was truly international with movies from; Egypt Feature presentation ASMAA, Switzerland “Good Bye Mandima”, Mexico “Gustavo”, Lebanon “Good Bye…Hide & Seek.” And the 2012 Oscar Nominated short film RAJU. All movies were screened in an amazing 345-seat stadium-style theater at the Los Angeles Film School on Sunset Blvd. in the heart of Hollywood. The award winning films from EIFF will now travel to three more cities; Palme de Mallorca Spain, Cairo Egypt and Dubai UAE where the festival will travel to throughout 2012. Next stop Palma de Mallorca, Spain!